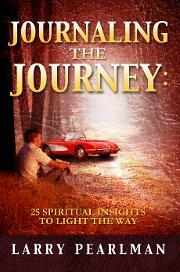 Larry Pearlman: "Journaling the Journey"
Welcome to my website! "What's in it for you?" you might ask. Well - there's information about great books, archives of radio interviews I've done with incredible people, an insightful journal of my Peace Corps experience, and an introduction to one of the oldest intentional spiritual communities in the U.S. There may not be free tickets to Tahiti but there is information about an amazing Costa Rica Retreat that you would LOVE! "...If you're looking for a book that will show you the steps you must take to awaken to your Divine Purpose, this is it." Alan Cohen, author of A Deep Breath of Life: "This is a book filled with vision, passion, and heart...After reading these inspiring ideas, you will want to get up and do something to make your journey the highest and brightest expression of your spirit." Interviews with Gregg Braden, Don Miguel Ruiz, Joan Borysenko, Lynne McTaggart, Steve Bhaerman (Swami Beyondananda), Barbara Marx Hubbard, James Twyman, Matthew Fox, and others leading the paradigm shift from separateness to Oneness.